What will the future of education look like? 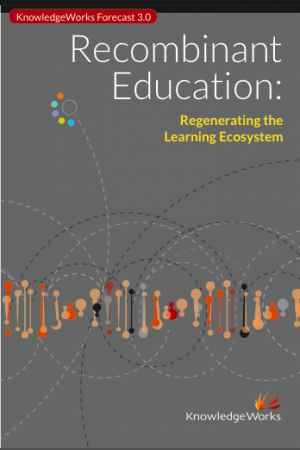 KnowledgeWorks Foundation has just released the third edition of its education forecast, called Forecast 3.0, Recombinant Education: Regenerating the Learning Ecosystem, that outlines the deconstruction of the current education model, a change in educators' roles based on their strengths, changing career pathways, and the role of technology in this realm. The language might seem a bit futuristic, but the insights are fascinating. Below, two short excerpts. While the digital explosion has long been creating an expanding ecosystem of new services, applications, and tools, innovative business models will find new ways of harnessing these opportunities into flexible value webs that deliver highly customer-centric experiences. Across industries, new intermediaries, novel customer value propositions, and creative ways of facilitating open digital platforms and networks are already transforming customer experiences. For example, new intermediaries in the music industry have integrated platforms such as iTunes, Google+, and Facebook with artist information, concert databases, and mobile apps to transform passive listeners into active music participants who share, create, remix, and produce music. In education, new intermediaries will facilitate a similar integration of networks and systems that bring learners, resources, services, data, and learning agents together in novel value webs. Schools will no longer be singular, enclosed organizations. Schools will no longer be singular, enclosed organizations. Instead, they will serve students by harnessing and brokering resources and talent across the global community. Customer-centric value propositions will guide the creation of learning experiences that leverage rich value webs to serve distinct populations. What began as a “bring-your-own-device” (BYOD) movement may very well turn into a “create-your-own-school” movement as new intermediaries, learning agents, parents, and learners collaborate to weave vibrant value webs. This increasing customization of learning will involve recombining learning experiences, assets, and tools to help each learner find the specific value proposition(s) that best meet her or his needs. Opportunity: Watch for schools to create distinct value propositions and identities and to partner with other organizations as part of complex value webs that offer personalized learning for all students. Challenge: If inertia prevents today’s public education system from responding constructively to disruptions, students, parents, and learning agents will create alternative value webs that may or may not be accessible to all. As big data floods human sensemaking capacities, cognitive assistants and contextual feedback systems will help people target precisely their interactions with the world. We are entering the era of big data. As the cost of digital devices and technologies continues to decrease, trillions of gigabytes of data will be generated from sensor networks, mobile and context-aware devices, and online interactions. The increased volume, velocity, and variety of data will be so vast that basic information-filtering tools and practices will no longer suffice. The expanding infosphere will drive the adoption of cognitive enhancements and assistive technologies that will help us discern meaning from the world while avoiding overload. It will also raise new possibilities for surveillance, opening deep debates about privacy and trust in data. Despite such concerns, we will increasingly make use of cognitive prosthesis – a shoring up of our minds with software assistants and feedback systems that help us discern information flows and improve our decision-making and outcomes through data integration, alerts, and automation. Deeper insights into brain processes and into cognition and motivation under varying conditions will inform both the design of cognitive assistants and our understanding of how to structure learning and work environments to maximize focus, intrinsic motivation, and creativity. Data analytics, dashboards, and visualizations will be critical for extracting insights and meaning from continuous data flows. Such sophisticated analytics will help learning agents provide preemptive and continuous whole-person support based on factors such as learners’ health, environments, and social contexts, as well as their academic performance. Using such tools in education recombination will help regenerate learning at the level of the individual. Opportunity: Watch for massive data sets, learning analytics, and dashboards to enable radically and continuously personalized learning for all learners based on their performance and motivation. Challenge: Interventions based on automated alerts and signals could create data blindness by reducing human intuition and limiting insight; to the extent that automation correlates with lower cost, this risk could be especially pronounced in low-income communities. Be sure to read the rest of the document.